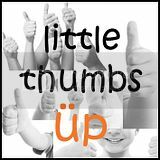 Time really flies, today is already the last day for April’s Little Thumbs Up – Orange Theme. 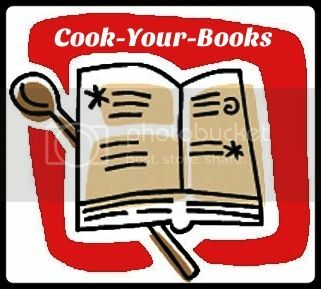 I want to thank everyone who participated in this event, sharing your amazing creations and recipes. Tze of Awayofmind Bakery House is our next host for May’s Little Thumbs Up – Milk Theme. Please continue to share your recipes using milk in the ingredients to support Tze and Little Thumbs Up. 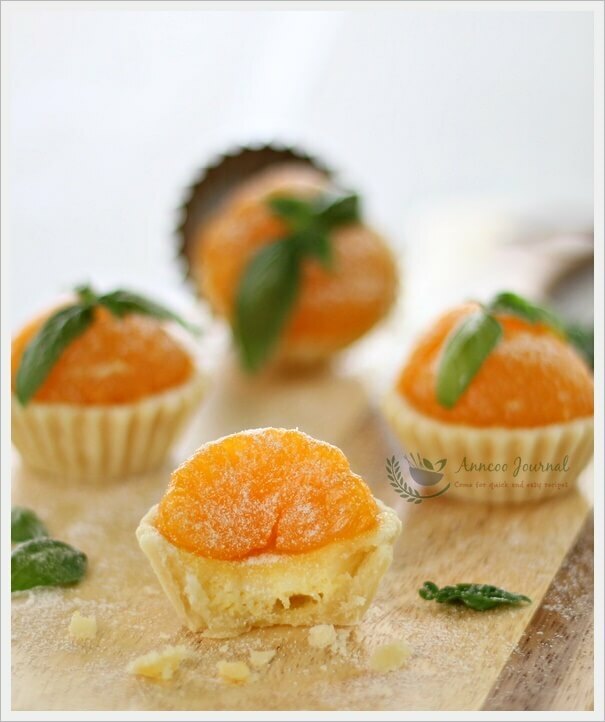 Here is last my last post ~ Mandarin Orange Tarts for Little Thumbs Up – :Orange Theme. These cute little tarts were made of sweet crust pastry and tangy of orange custard. They were wonderful and tasted delicious with some mandarin orange garnish. You can make the crust pastry and shape it into tart shells a day ahead, keep refrigerated. As for the filling this can be done the following day. They look very impressive and is a perfect treat to serve at a birthday party or any other occasion. ~ drain and blot the oranges on paper towel to remove excess liquid. Sweet tart pastry - Sift flour and icing sugar into a bowl. Add cold butter and rub with your finger tips till mixture becomes sandy. Add in ice water and knead mixture to form dough. Add a little more ice water if the dough is too dry. Shape it into ball and wrap it with foil then store in freezer for about 10 minutes. Press a small piece of dough (about 12g) into tart tin. Trim the edges with a sharp knife. Prick the pastry at the bottom of the case with a small fork. Bake at preheated oven at 180C for 20 minutes till pale yellow. Remove and set aside. Filling - Mix all the fillings ingredient in a measuring cup, stir gently till sugar dissolved and strain through a sieve. Pour fillings into baked tarts till 90% full and bake at 180C for 15-20 minutes and leave to cool on wire rack. Top with some mandarin oranges and dust with icing sugar/snow powder or brush with some apricot gel on top. The tarts look delicious! May i ask what are the leaves use to decorate on the tarts and where can i get them? Thank you. Those are basil leaves from my garden. You can buy it from the supermarkets at Fairprice or Cold Storage. Gosh, Ann…. they look too cute to be eaten! Just drooling over the clicks! Very very pretty!! I love it! 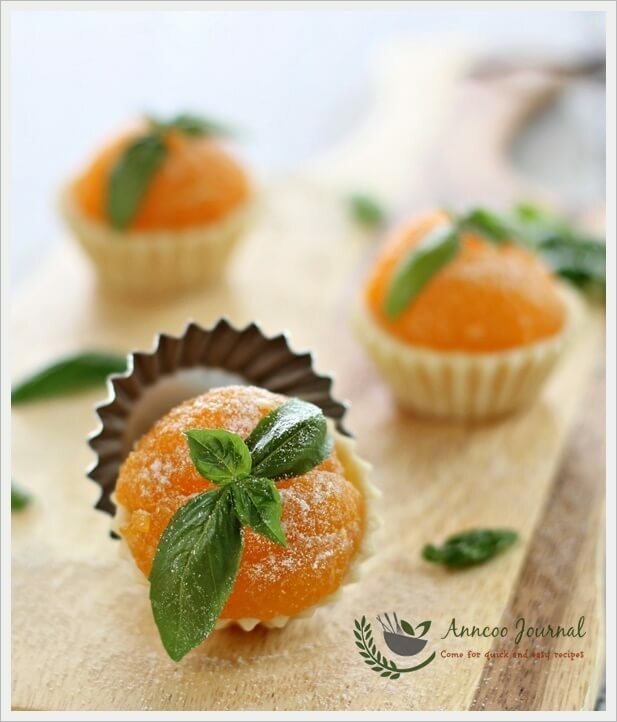 Ann, I have not see canned mandarin orange, the tart looks so delicious and adorable! Perfect for all occasions! Thanks for helping me to promote LTU, really appreciate that! HI Ann, sorry that I didn't post enough of orange recipes on your LTU! Looking at the last picture only made me realise that it was the mandarin orange that was topped on the mini tart! I thought was the curd or jam which look like the pineapple tart, you know what I meant? They look beautiful! No problem, Jessie 🙂 Is just a fun event. You can join next month LTU to support TZE too. hahaa… maybe one day, I'll create one like the pineapple tart. Dear Ann, thank you for hosting LTU April's Orange theme. Your Mandarin Orange Tarts are so impressive and lovely. Will bookmark this. It looks delicious and perfect to snack on anytime of the day! These little tarts look so cute! Sunny, sweet and delicious! 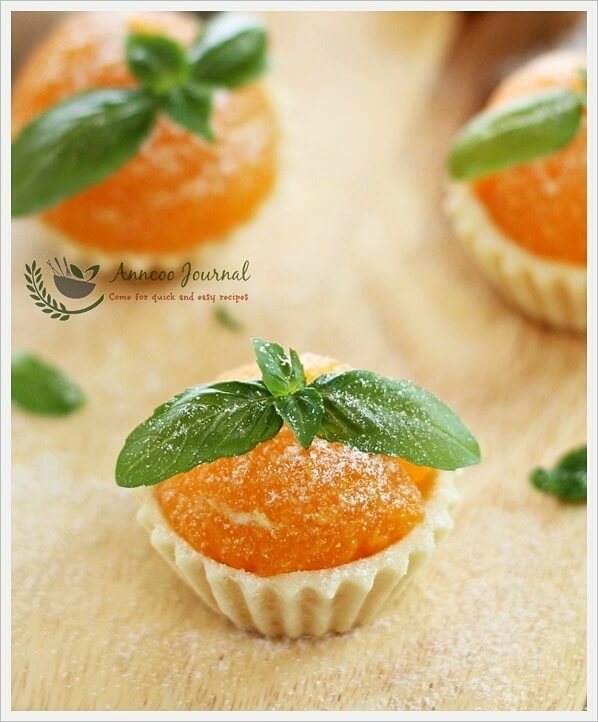 I still have a can of mandarin oranges, was thinking to make similar tart to support your LTU, but running out of time, have to make this time., hehehe..
Hi Ann, these are really lovely to see and good to eat. Very nice. Bookmarked. 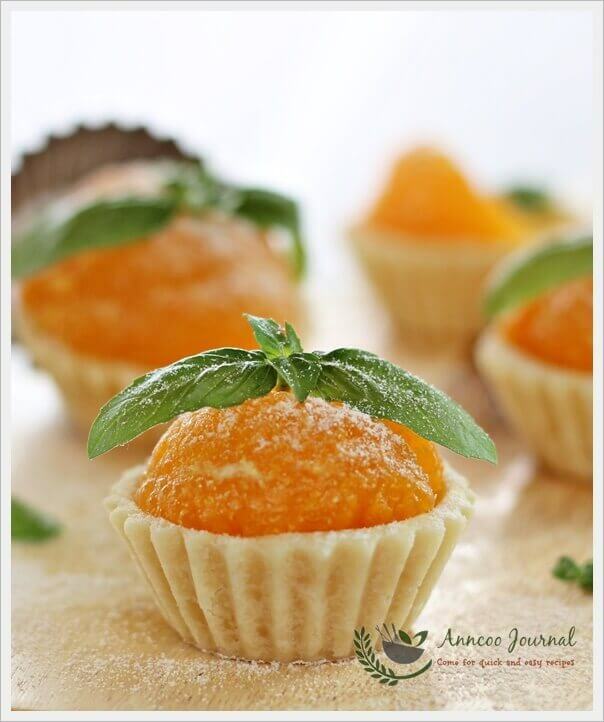 Ann, your mandarin orange tarts are so elegant and pretty! Nice to pop into the mouth and savour the sweet orangey taste. Yummy! Gorgeous tartlets, Ann. The orange filling sounds amazing. Thank you, Victoria and your support to LTU too! Like Louise, I had the same problem, not able to comment on your blackberry and orange salad… dunno why??? Yeah… Time flies so quickly!!! I was trying to catch up to comment the linking participants but I don't think I can manage to visit them all… too many at a go! Ai yo!!! Before I forget… I must say nice tarts!!!! I just told Lousie the same problem that I had using Safari. Did you sign in to blogger.com before leaving comment? I'm now using my desk top (Firebox or Chrome) and sometime Samsung tab 4. I am totally speechless looking at this BEAUTIFUL petite tarts. Absolutely gorgeous!! Im sure it taste awesome!! (Im sorry I did not participate any Orange post…Well I did bake one orange cake but it didnt turn out well. Hopefully next time will support you again). What a time I've been having commenting on your blog. It must be the version of Safari that I'm using. I saw your refreshingly beautiful Blackberry and Orange Salad this morning and for the life of me I just couldn't comment. It really was so "purty." Hi Louise, Thank you for your compliment. I've the same problem as you when trying to comment on some bloggers' blog using Safari. I think we need to sign in to blogger.com on Safari before leaving comment.